Tides and Tales is proud to announce the arrival of an other great Fishing Charters boat, our newest addition to the fleet! "EarleeJune" is named in honor of the EarleeJune Fish Co, that was located in Dunnville Ontario. The vessel and company was owned by Mikes grandfather Earl M Siddall, and commercially fished in the often turbulent waters of Lake Erie. The "EarleeJune", the new vessel is a 27ft OAL welded aluminum fishing machine. Equipped with twin Honda 130hp four stroke engines, she is fast, quiet and clean. 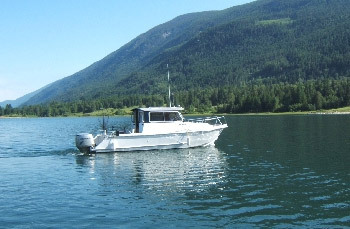 The Vessel was custom built in 2005 by Arrow Manufacturing, and is fully equipped for comfortable fishing and exploring. In terms of electronics this boat has radar amd depth sounder, sidescan sonar, chart plotter and Vhf radio. There is a dry cabin with a cutty to get out of the elements, and don’t worry ladies, there is a head (toilet) on board. Powered by steam, the original "EarleeJune" was known for landing huge hauls of Walleye, Yellow Perch, White Bass, Lake Whitefish and Lake Sturgeon. After several months of sea trials, the new EarleeJune has proven she is very stable, sea worthy and is ready to ply the waters of Northern Vancouver Island.